It’s amazing how many gaming conventions that we’re used to were actually born out of limitations to the technology at the time. Developers had to creatively work around problems to make sure that the user experience was a good one. 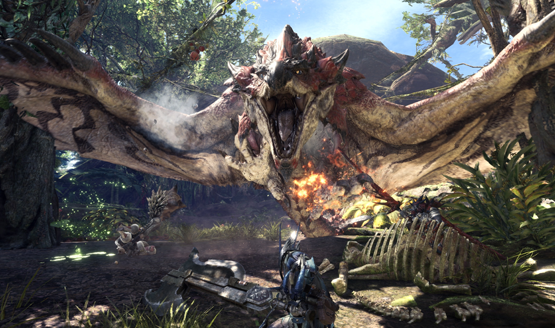 There are myriad topics that could be discussed surrounding mechanics that were created this way, but all eyes are currently on Monster Hunter: World and its lack of health bars for the enormous beasts. The first time you come upon an Anjanath, it’s pretty likely that you’re going to die. In fact, it’s happened to me on more than one occasion, where I didn’t even intend to fight the fire-breathing tyrannosaur, but ended up on the wrong side of its teeth, tail, and scorching hot breath. When my wife and I were finally ready to fight it, we still failed a couple of times before overcoming the challenge. The same thing happened with Diablos. And then it all happened again once we reached the high-rank hunts. But we were having fun. Monster Hunter: World makes it fun to fail, and the ease at which failure comes makes each victory even more special. We feel like we earned it. The focus is taken off of whittling down a health bar. Instead, we’re focused on tactics. Dodging, running, moving to advantageous positions, and drawing its attention away from each other. Maybe we need to switch to a different weapon, or adjust our armor setup. Each failure has us reassessing how we’re playing. We no longer say “Oh man, we got him down to 30% health! Well, let’s try again.” Instead we focus on what we did wrong during the fight, and what we could be doing better. That’s a level of realism that isn’t present when you know exactly how much more an enemy can take. That’s not to say that there aren’t moments where it’s clear we were close to a kill but still ended up failing. Visual cues replace what we’d normally call a health indicator. You’re forced to read the situation. Now we watch for a monster’s exhaustion as an opening. We see when other monsters are close and lure them into the fight. We wait for it to limp off, getting near the end of the encounter. We don’t rush in to try and finish off that last sliver of health, because we realistically don’t quite know how much is left. Going full Leroy Jenkins with the hammer could still end in failure. But it’s never about the health bar. We never justified it by calling death a cheap fail with only a sliver of the beast’s health left. The onus was on us as the hunters. We failed to read the situation and approach with caution. We failed to confirm the kill before putting ourselves in a dangerous position. Mission time also plays a part. With a detailed Monster Hunter health bar, you could kind of match up how much time you have remaining with the damage you’ve dealt. In Monster Hunter: World, you have to balance mission time with strategy. Is 15 minutes left enough time to kill it? Do you have time to take a detour and scavenge for supplies or take down another monster? Do you have time to lure another monster into the fight and risk having to fight two beasts at once? Removing health bars increases the sense of urgency present to beat the timer, particularly on tougher missions with more target monsters. Likewise with captures, it’s never about the monster reaching a specific threshold and then knowing you can capture it. You have to watch it carefully, note the visual cues, and then lay your trap. Misreading those visual cues can easily lead to wasting traps and tranq bombs, or even killing the monster before you can capture it. Monster Hunter: World tells you everything you need to know during a fight, it just does so in unconventional ways that break away from how gaming has done it for years. It embraces a little more realism and shrugs off old traditions that have been built into gaming’s foundations. Weapon selection also comes into play. Monster Hunter: World has 16 weapon types to choose from, and myriad upgrade paths for each. I’ve always been the type to get in close and deal high damage (that’s why I’m a Titan main in Destiny). Swords and hammers have been my weapons of choice in Monster Hunter: World, but facing multiple failures at close range made me rethink my strategy. If Diablos had a health bar, I’m sure I could have justified failures to myself using the amount of damage that I was doing. As it was, the numbers that pop up were enough to have me wary of switching to the bow, doing significantly less damage that I was with my Anjanath-slaying water hammer. If I had rooted myself in weapon choice based on the chunk of damage done to Diablos, I might still be trying and failing to this day. Without being able to see its health bar, I was able to untether myself from my close-range, damage-dealing habits and work out a new strategy using a new weapon. It’s hard, but that’s the point. Monster Hunter: World is designed to make me–the player–a better hunter, rather than just leveling up and making my avatar more powerful. Modern games are filled with information overload. Some of it is required to realistically make up for senses that are lost in the translation to 2D images on a screen, but sometime it makes us worse gamers as we take certain information for granted. There’s a fine balance between realism and an engaging user experience. Developers will be experimenting with that scale for years to come, but Monster Hunter: World has done an impressive job of removing something players are so used to, and making the whole experience better for it. I’m not saying that every game should take the same approach. 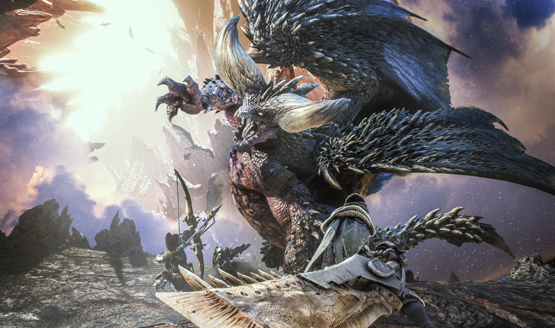 Adjusting familiar and well-rooted systems is like playing with fire, but Capcom found a way to make Monster Hunter fun that breaks from the health-bar tradition, and it makes me a better monster hunter.